Illuminated Loops; The Fuzzy Logic of Synaesthetic Feedback. This project feels like the collaboration of a lifetime, a meeting of minds who create from the senses sight and hearing. 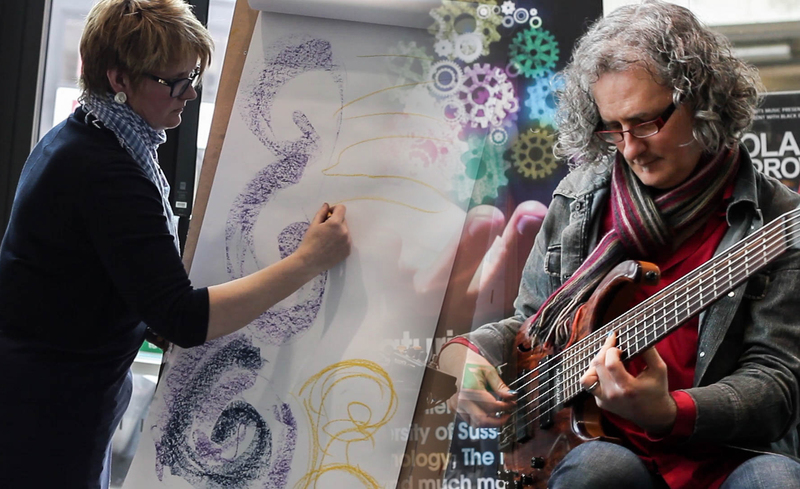 It is is an ongoing series of live art performances with Steve Lawson, solo-bassist. My synaesthesia gives me a visual response to sound, especially music. As Steve plays, building a glorious, layered, soundscape, I respond through large-scale drawings of what I “see” synaesthetically (shape, colour, movement). Steve then uses the new images as a visual score and improvises further. A feedback loop is created between us the sound building the drawing and the drawing influencing the music. Although music and visual art are diverse disciplines springing from and serving two different senses we push beyond the physical object or sonic creation and allow the visual, musical, aural and performance artwork to develop. Sign up to my email list using the form at the bottom of the page or follow me on social media to find out when and where we are performing next.